Strauss from Japan? Don’t be perturbed, but celebrate, because the results are excellent. 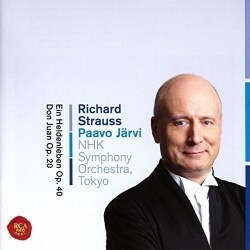 Paavo Järvi took up the reins as chief conductor of the NHK Symphony Orchestra in the autumn of 2015, and for their first big recording project they turn to three planned discs of the orchestral music of Richard Strauss. This first instalment is really good, not least because the Japanese musicians approach Strauss’s music from a different angle to most of their recorded rivals, and the results are well worth hearing. The first thing that strikes you is the nature of the orchestral sound. It’s light, breezy, airy and really quite wonderful. Järvi’s fast tempi help, but you can’t get away from the fact that the sound is really very un-Germanic. You might think that’s a bad thing in Strauss, a composer who sits right at the heart of the Austro-German tradition. In fact, however, it is different but remarkably successful, and so new-sounding as to be very refreshing indeed. However, don't believe any of the all-too-easy clichés about the sound being explained by this orchestra’s distance from Europe and from European culture: they’ve had several German conductors, and they’ve been playing this sort of repertoire for nearly a century. They sound this way because Järvi and the players want them to sound this way, so don’t try to explain it away: just embrace the new insights and the freshness that it brings. There is weight when you need it, of course, most obviously in the vigorous, upwardly thrusting hero’s theme that opens Heldenleben, underpinned by sumptuous basses and with a gorgeously rich tone. The recording helps, too, placing the woodwind snipings of the adversaries right at the front of the sound and making them very present. The solo violin - played with not only great virtuosity but also uncommon sensitivity by Fuminori Marco Shinozaki - also benefits from a forward placing, but this gives it a pleasingly concertante feeling of togetherness, with the violin and orchestra answering one another’s questions like companions. The live-ness of the recording is an almost unalloyed benefit, generating energy and spur-of-the-moment excitement that you don’t always get in the studio, and it helps to make the battle scene sound powerful, especially from the thunderous percussion. The only major downside comes there, too, because the offstage trumpets from that section’s beginning can get swamped as the orchestra cranks up. However, the build to the return of the Hero’s theme (track 5, 6:07) is thrilling, as is the first emergence of the Don Juan theme at the outset of the Works of Peace. The rest of that section is then characterised by some lovely solos and a persuasive sense of flow that leads into a sensationally lovely treatment of the Hero’s Retreat theme: the string tone at track 7, 3:51 will delight you, and even the attempts of the Adversaries to overthrow it can’t succeed. The final, temporary fortissimo blast feels perfectly judged, Järvi giving us a long, slow build up and then releasing the tension at just the right time. This is a Heldenleben that deserves to stand alongside many more prestigious Central European readings, not because it threatens to unseat them, but because it’s refreshingly different, and a similar lightness of touch characterises an effervescent, brilliant Don Juan. The opening flourish will make the hairs on the back of your neck stand up - just listen to the clarity of the timpani and glockenspiel! - and the shimmer surrounding the first love theme is delightfully seductive. The rest of the work benefits from that lightness of sound I mentioned above, so that Don’s amorous escapades have a dance-like quality to them that’s both entirely appropriate and utterly engaging, interrupted by moments of delectable beauty, such as the gorgeously played oboe solo for the second love theme. The great horn theme at the ten-minute mark rings out with thrilling clarity, and the trumpet solo at 11:41, so easily missed in many recordings, oozes the character of a Yorkshire colliery band. The hero’s demise is shocking, as it should always be, the wisps of his spirit seeming to linger in the violins, and the effect is both poignant and at the same time unarguable in its suddenness. A hit, then! I look forward to the next instalment.